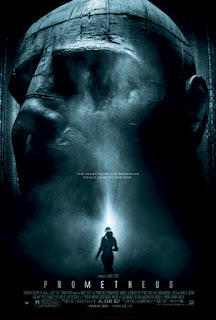 On Sunday afternoon Tim, Andy, Kev and I went to see Prometheus at the IMAX in London's Waterloo. We had to fight our way through the crowds of people who had turned out for the Queen's Diamond Jubilee flotilla on the Thames but it was worth the struggle. As a sort of Alien prequel it certainly ticked all the boxes. Not as scary though; more sci-fi than horror. I won't give any spoilers here but suffice to say I have a feeling there might be a sequel to the prequel in the pipeline. Michael Fassbender was excellent although Guy Pearce looked a bit weird. The film did give me nightmares that night so it obvious affected me more than I'd first thought.